Frigid temperatures, mixed with 177-degree water, is a recipe for an icy disaster when the water leaks. 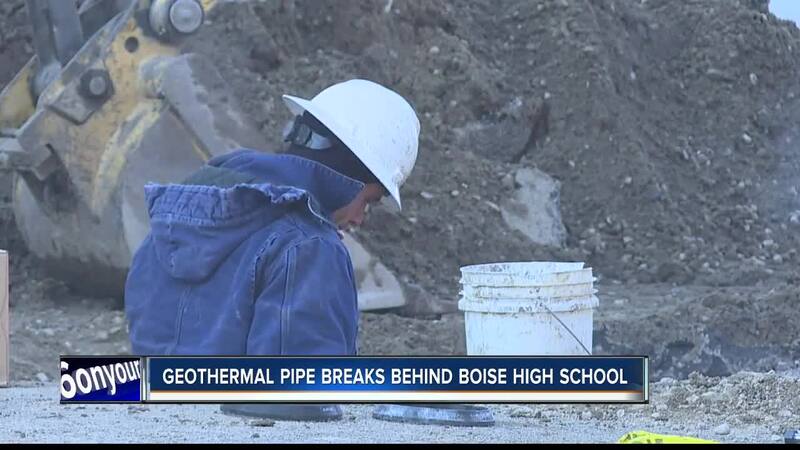 Unfortunately, it was a hazard facing parents, students, and staff at Boise High School today when one of the geothermal lines broke on Franklin Street. Ultimately leading to Franklin Street remaining closed until Friday. "It was dangerous from the standpoint of the hot water, and we certainly sent out an emergency text message indicating to parents and students to please stay away from the area," said Dan Hollar, Public Affairs Director for the Boise School District. That was following a geothermal pipe break which left Franklin Street blocked off between 10th and 11th streets until Friday, which also left heat to Boise High cut off, forcing the school to use stored geothermal heat, already in their heat exchange, in order to hold school Thursday. It was the third, large break in Downtown Boise in under three months. "It's important to remember that this is older infrastructure so, the original geothermal system was laid in the 1980s," said Colin Hickman, Communications Manager in the Public Works Department, for the City of Boise. The pipes that broke Thursday were part of the original, 1983 system, and many of the leaks and breaks are due to corrosion, from hot water running through 30-year-old concrete pipes. "Anytime there is any sort of disruption, whether it's a leak or a break, we take that really seriously, we really want to understand what's going on, what caused something to fail," said Hickman, which helps them remain proactive when it comes to potential future leaks. "When Ada County Highway District is doing repairs to any of the roadways, if anything is being dug up, we want to make sure that we're there to get in, if it's older pipe, we also take those opportunities to replace older pipe," said Hickman. But they also prioritize replacement of more critical pipes, in order to avoid larger disasters. "While we're going to look to expand, in different uses that we can grow the geothermal system, we also know that reliability is incredibly important," said Hickman. Now, the city is trying to be more innovative with replacement materials, so they now use fiberglass pipes, which are expected to last longer, as the city moves toward expansion of the geothermal heat system.